The next step in development of "The Draw of Glenfallow" is underway. The adventure module has already been put through first round play tests. Some revisions are underway, to enhance the game play experience. So I'm taking feedback from the play test groups to address some points to make the adventure even easier for the dungeon master to use, and working on encounter dynamics to provide a more enjoyable game play experience. Art is nearing completion and maps are being drawn up by James Lee. Art for the book is currently being created by Rebecca Elisbeth Coulthart, Brian Lee, James Lee, Christian Martinez, and Phoenix O'Faerie . Encounter Scale System (TM) maps will be developed for this product as well. They will be provided for backers on the KickStarter for this module (at any backer level that includes a PDF reward), but will be available as a separately downloadable map pack after that. The Draw of Glenfallow is the first book in the Tarot Adventure series of adventures. These books will build on the relationship the player characters may develop for the principle NPC "Pieron". Pieron was just another commoner until an encounter with a mysterious woman and a magical deck of cards changed his destiny. Now Pieron is seeking out stout companions to aid him in claiming his birthright, the Keep at Glenfallow. Overrun by Monsters a century ago, the Keet at Glenfallow now lies in ruin. Will you help Pieron face unknown peril? Would you dare to stand beside the future lord of Glenfallow as he struggles to retake what is his? Can you forge the destiny of a newly minted lord? A host of monsters stand between Pieron and his destiny. 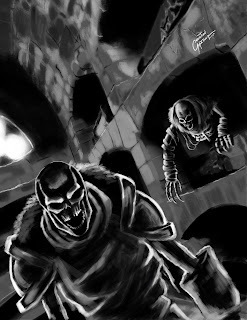 The malicious goblin chief lords over his subjects, and dark creatures stir in the catacombs beneath the Keep. Will you gamble your future on the Draw of Glenfallow? Written for characters of level 1 to 3, this module is being designed for successful resolution in a single session. A great module to begin a new campaign, well suited for a parallel story line, or as a one shot adventure. The Draw of Glenfallow is meant to be DM friendly, challenging, and fun for players. So what is going into the design of this module? I focused on the story I wanted to tell. Then I designed encounters that were level appropriate, thematically appropriate, and that would provide challenges that were fun to engage and overcome. The module rewards players in a variety of ways. The actions of the group can provide them with a powerful ally, or alienate a young lord. Which path will your character's trod? The Draw of Glenfallow is being designed to be a great resource for introducing new players. If you have players who are new to role-playing games, this adventure is a good way to introduce them. While the encounters are challenging, the module isn't overly complex and is also designed and formatted to be easy to use by the dungeon master (allowing for time to provide guidance to new players if need be). Thank you for joining me, once again, on my adventure into publishing.